HUNTERDON TAKES BACK TRENTON BUS TOUR AND MORE! THIS COULD TURN OUT TO BE THE BEST BUS TOUR WE HAVE RUN YET! Join us for a unique opportunity to tour Hunterdon County's original County Seat -- Trenton. This all day bus tour will be guided by two of the best Revolutionary War story tellers around: our own County Historian and author Stephanie Stevens and the Executive Director of the Old Barracks, Richard Patterson. On SATURDAY, JUNE 11TH, Our deluxe coach, equipped with both a restroom and air conditioning, leaves the East Amwell Municipal Building promptly at 9:30 am (please arrive by 9:15 am) and arrives at our morning stop, the Old Barracks. During the French and Indian War in 1758, the Old Barracks was constructed by the colony of New Jersey in direct response to petitions from local residents complaining about compulsory quartering of soldiers in their homes. Throughout the Revolutionary War, British prisoners of war were held in the Officers' House, 4 companies of the Second New Jersey Regiment of the Continental Line were raised here, and in 1777, the Barracks became an army hospital. At the beginning of the month of December, 1776, British and Hessian troops occupied Trenton, and briefly stayed in the Barracks prior to the Battle of Trenton. Loyalists also arrived, seeking protection from the soldiers and were believed to be staying at the Barracks when Washington marched into Trenton on the morning of December 26th. The bus will then bring us to the Trent House built on an estate of 300 acres around 1719 by William Trent for whom Trenton was named. During the American Revolution, Hessian soldiers occupied the houses. Later, the then owner of the property, Dr. William Bryant, was thrown out of the house because he was a Tory sympathizer. It became a supply depot for Washington's army. Tours are timed, so while some of us enjoy dessert, others will enjoy guided tours of the house and vice versa. Once back on the bus, Richard and Stephanie will guide our bus around Trenton to see the best and most important Revolutionary War sites including the site of the Battle of Trenton and the location where the original Hunterdon Courthouse stood -- notably the site where, on July 8, 1776, the first reading of the Declaration of Independence occurred in New Jersey. We will visit historic churches, graveyards and the Quaker Meeting House AND more while Richard and Stephanie share some great stories, banter and tales about Trenton, Hunterdon County's Revolutionary War history. We will begin to head back to OUR Hunterdon County around 4 pm. $30 all inclusive day trip includes deluxe coach, two amazing tour guides, all your admissions, lunch, snacks, tip! Reservations required -- call us at (908) 788-2030 or reserve at www.hunterdon300th.org. Once you have ordered your ticket(s) from Eventbrite, please send your check to confirm your reservation(s) to The Hunterdon 300th, 3 Chorister Place, Flemington, NJ, 08822. June 7 Washington's Crossings and Battles in Hunterdon: Everyone knows about General George Washington crossing the Delaware from Pennsylvania to what is now a New Jersey State Park on Christmas Eve. And everyone knows about the Battle of Trenton on December 26th. But most people don't know about the second crossing at Coryell's Ferry in Lambertville nor about the Second Battle of Trenton, Hunterdon County's County Seat in 1776. Trenton's Old Barracks Museum's Executive Director, Richard Patterson, discusses the crossings and battles and their significance and importance to American history. Mr. Patterson is not only a recognized expert on the subject, but a terrific storyteller. This is not a lecture to miss! Main Branch of the County Library; 7 pm; Refreshments follow; Free. CELEBRATE 240 YEARS OF INDEPENDENCE WITH OUR NEW T-SHIRT! 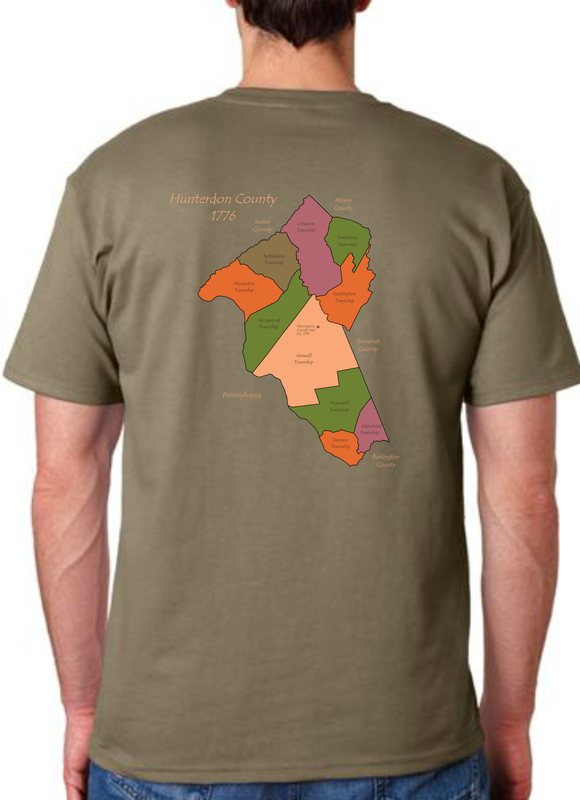 IN A GREAT NEW COLOR SAGE, THIS HIGH QUALITY AND LOCALLY PRODUCED T-SHIRT SHOWS OFF 1776 HUNTERDON COUNTY WHICH INCLUDED MOST OF WHAT IS NOW MERCER COUNTY, INCLUDING THE AREA WHERE WASHINGTON AND HIS ARMY CROSSED THE DELAWARE AND MARCHED INTO TRENTON, HUNTERDON COUNTY'S BATTLES IN THAT FAMOUS WINTER! WEAR THE 1776 MAP OF HUNTERDON COUNTY PROUDLY THAT SHOWS THE WORLD THAT WASHINGTON CROSSED THE DELAWARE AND FOUGHT THE BATTLE OF TRENTON IN HUNTERDON COUNTY! 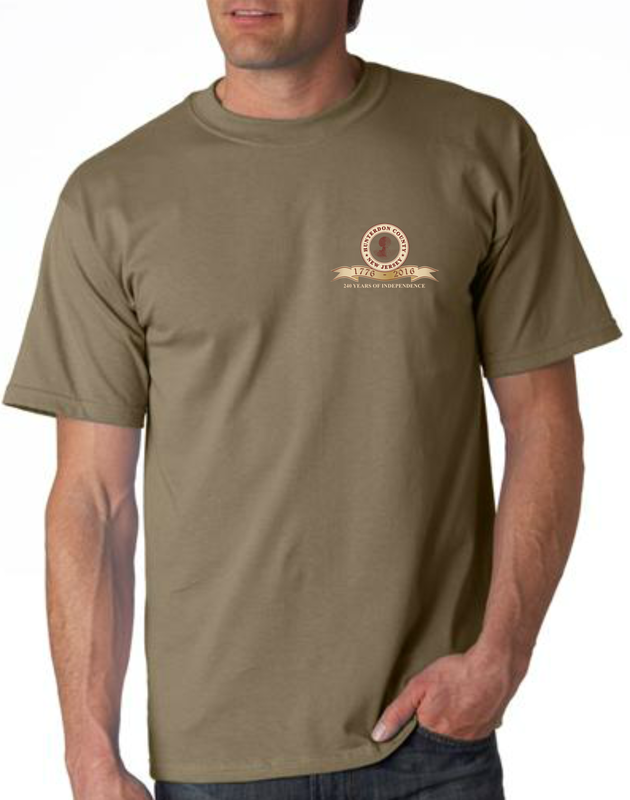 SIZES SMALL THRU EXTRA LARGE, $15; SIZES 2XL AND 3 XL, $17. AVAILABLE AT ALL OF OUR LECTURES; TO MAKE ARRANGEMENTS FOR A PICKUP AT ONE OF THE COUNTY LIBRARIES OR AT THE FLEMINGTON CHOIR SCHOOL, PLEASE CALL US AT (908) 788 2030. 100% OF ALL PROCEEDS GO TO UNDERWRITE OUR HERITAGE LECTURES AND EVENTS. REMINDER: SATURDAY, MAY 21ST WASHINGTON'S CROSSING TOUR AND LUNCHEON POSTPONED TO SATURDAY, SEPTEMBER 10TH. WE HOPE YOU'LL JOIN US THEN! MAY 17TH: THE REVOLUTIONARY WAR IN PITTSTOWN: What really happened in this small hamlet known as Pittstown during the American Revolution? County Historian Stephanie Stevens knows. Drawn from recently uncovered documents, Ms. Stevens will share its importance that for hundreds of years was forgotten. Main Branch of the County Library. 7 pm. Refreshments follow. Free. Celebrate Flag Day with the 300th! Flag historian and expert, Richard Pierce, presents new research with a terrific lecture and powerpoint show. We remember "Don't Tread on Me" and Betsy Ross' flag, but there was no single recognized flag in 1776 -- every colony and militia seemed to have their own. This is the place to be for all loyal patriots on Flag Day! Main Branch of the County Library; 7 pm; Refreshments follow; Free. SUNDAY, MAY 15TH TEWKSBURY’S HISTORIC SITES & LANDMARKS LECTURE The Tewksbury Historical Society will host a lecture on Tewksbury’s Historic Sites & Landmarks by Tewksbury Historian Shaun C. Van Doren on Sunday, May 15th at 1:00 p.m. at Society Headquarters in the Mountainville Meeting Hall, 60 Water Street, Mountainville. The talk is free and open to the public. Refreshments will be served. The talk will illustrate Tewksbury’s officially designated historic sites and landmarks in the Township’s Master Plan and Development Regulations Ordinance. Ever wondered where Farley’s vault was or who was buried there? Cold Spring Cottage? Cokesbury Hotel? James Melick Homestead? Dr. Oliver Barnet Homestead? Come hear about these sites, Tewksbury’s churches and more. We’ll look at old photos as well as what they look like today. And what does it mean to be an historic site or landmark. Have old photos? Bring them to share. SATURDAY, MAY 21: TRADITIONAL AFTERNOON TEA EVENT AT THE JOSEPH TURNER HOUSE Please join the Union Forge Heritage Association for a Traditional Afternoon Tea at the historic 1760 Joseph Turner House. Enjoy a perfect cup of tea along with a variety of scones, tea sandwiches, sweet treats and jam. Special Door Prizes and Raffles will be offered with admission. Our meticulously restored museum provides the perfect backdrop to enjoy a “common gathering” with noted orator Lady Ellen and the Oldwick Community Players in period costume. In addition to her presentationentitled “A Day In My Life in the 18th Century,” Lady Ellen will also discuss homestead life along with a show and tell of actual 18th Century home wares and fashion from this bygone era. $30 per person. Seating is limited and payment by check is required before the event. Contact the UFHA by phone at 908-638-8170 to reserve your seat soon! Hosted by the Tewskbury Historical Society, Zion Lutheran Christian Education Building, 18 Miller Avenue, Oldwick, NJ 08858. The day includes continental breakfast, a talk by the Tewksbury Historical Society about the History of the Township, lunch, a guided walking tour of Oldwick, a guided tour of the Zion Lutheran Church & Cemetery, a guided tour of the grave of General Washington's spy, John Honeyman, and a self-guided auto tour of Tewksbury. $25 per person; For further information call 908 832 6734.